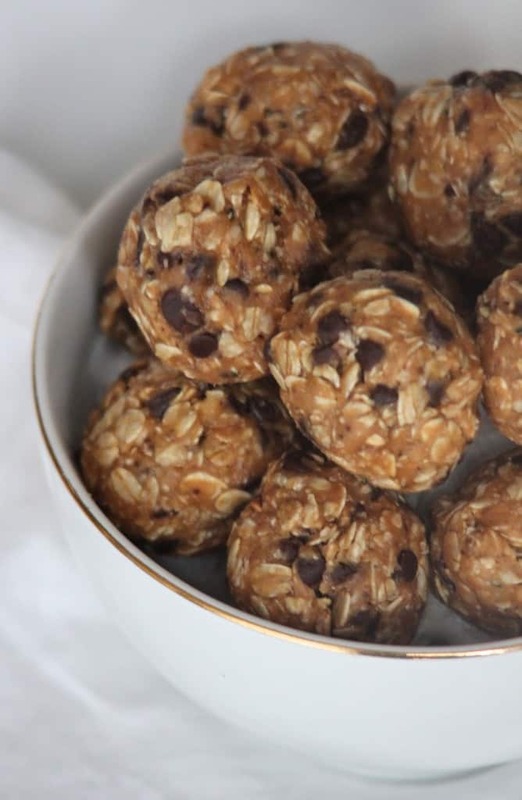 These 4-ingredient no bake peanut butter energy bites are simple and made with wholesome ingredients that you probably have in your pantry. Plus, they taste like cookie dough! I’ve been dying to share this recipe for no-bake peanut butter energy bites with you because they’re healthy, easy, and delicious! They’re so simple that I have all of the ingredients in my dorm room already, and that’s saying something. -They taste like PEANUT BUTTER OATMEAL COOKIE DOUGH. But they also happen to be healthy. -You don’t have to use your oven or stove! Hallelujah because this college girl’s only kitchen access is the shared dorm kitchen. -They’re perfect for popping right before a workout, sticking one or two in your lunchbox, or eating as a late-night snack. -They stay good forever in the freezer and they taste awesome frozen. -Did I mention these peanut butter energy bites only have 4 ingredients? First, measure out oats, peanut butter, honey, and mini chocolate chips. I was feeling adventurous, so I added ground hemp seeds, too, like some kind of hippie health nut, but I couldn’t taste them. Promise. Other people tried these bites and had no idea that they had a secret ingredient, so unless they read this post, they’ll never know! You could also add chia seeds, ground flax seeds, wheat bran, or your other strange health ingredient of choice. Stir it all up and marvel that it looks like cookie dough! At this point, some taste-testing is probably necessary for quality assurance purposes, of course. If the dough is sticky, you can refrigerate it for a couple hours or even pop it into the freezer for 30 minutes. Shape the dough into 2 dozen or so balls, and then refrigerate for about an hour before enjoying. 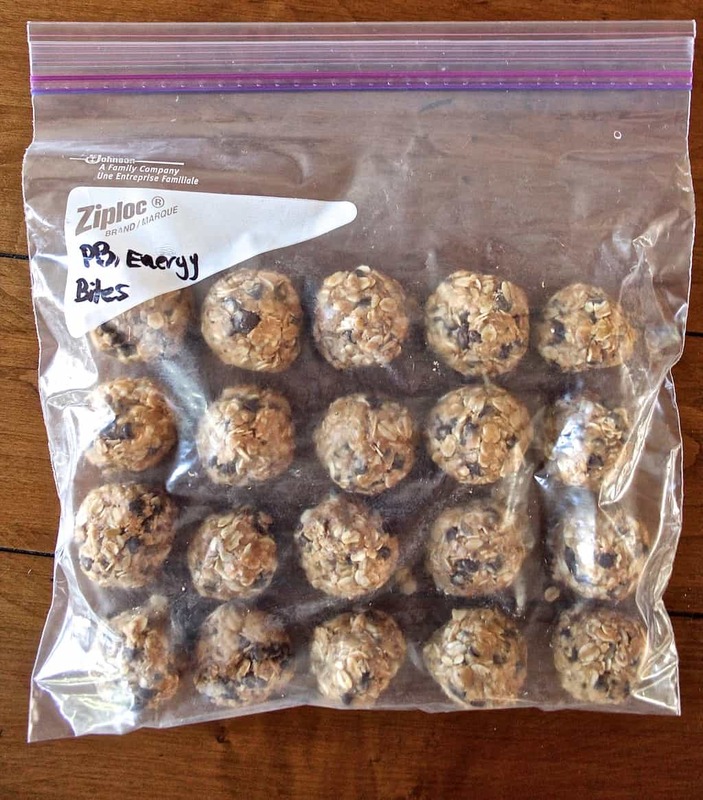 To store the energy bites, you can place them in a container or gallon-size bag and stash them in your fridge or freezer. I’ll be making these peanut butter energy bites again soon, and I’ll be doubling the recipe when I do! If you try these peanut butter chocolate energy bites, feel free to let me know in a comment or take a picture and tag me @livbane on Instagram! I’d love to see! Healthy energy bites that taste just like peanut butter oatmeal cookie dough! 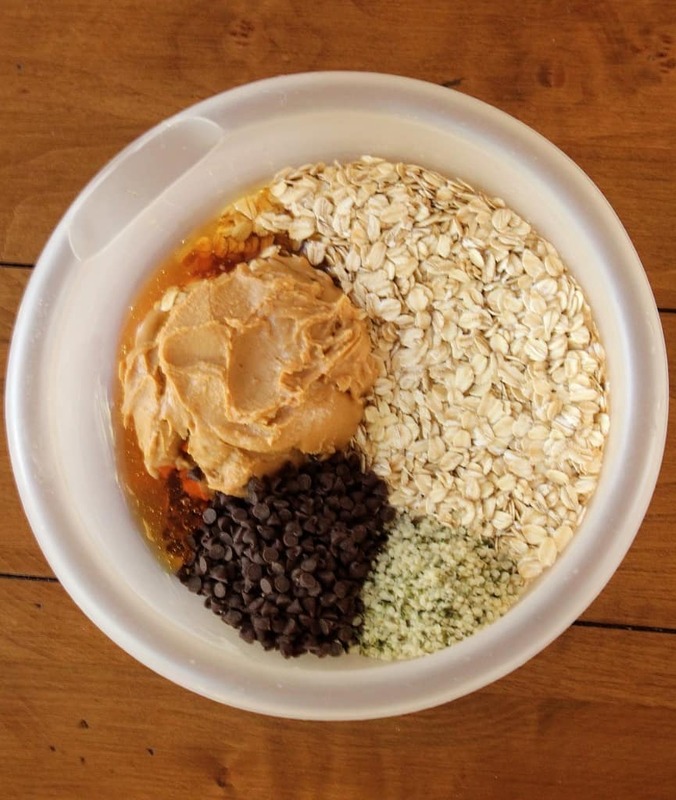 Add peanut butter to medium microwave-safe mixing bowl. Microwave for 30 seconds, or until peanut butter is less solid. Add the rest of the ingredients to the mixing bowl, and stir for 2-3 minutes minutes until fully combined. At this point, if the dough is very sticky, you can refrigerate it for a 1-2 hours or pop it in the freezer for 30 minutes to slightly firm up. 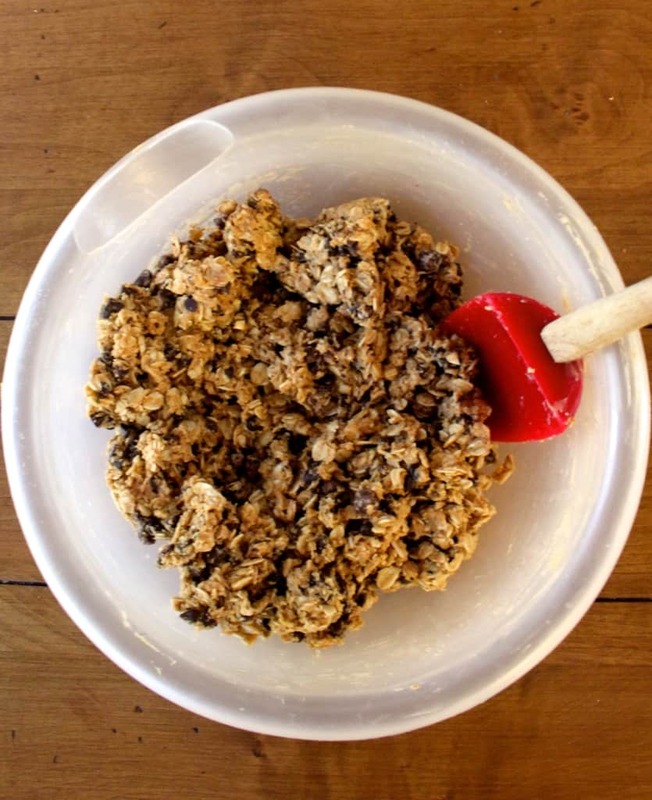 Using a cookie scoop or spoon, form the dough into about 24 tablespoon-sized balls. Place on wax or parchment sheet or dish and refrigerate for about an hour before enjoying. To store, place energy bites in a Ziploc bag or storage container. Refrigerate for up to 2 weeks or freeze for up to 3 months. Depending on the type of peanut butter you use and its thickness, you may need to add slightly more honey or peanut butter to help the energy bites come together. I’ve made something similar and they lasted me like 3 days. SO good! Awesome, I added a dash of cinnamon and a little unsweetened cocoanut (shredded) along with flax and hemp seeds, everyone raved about them. So glad to hear everyone loved them!! Thanks for sharing your yummy adaptations! I am going to try for the first time. I am using peanuts that are grounded into peanut butter . Hopefully it’s ok for my diabetes . I really need to start making these types of snacks! I really have no idea why I don’t! Woooooo finally one of these that you don’t need a food processor for!!! And I have all these ingredients. Could it be any easier? haha. I always add millet to my baked goods like this…you should try it. They’re so crunchy I love ’em! Mmmmm, I’ve actually had millet in muffins before and it was really good! I bet the crunch would be great in these, too. Mmm these would be perfect for a bedtime snack after a long night at the library! Thanks, Liz! Hope they turn out well for ya! Energy bites are the best thing in the world but it takes a lot of self control for me to not eat them all at once! I think that’s the trickiest thing about eating snacks you make versus prepackaged ones– not eating way too many since they’re all already unwrapped! buy snack bags, that way each bag will have only about 3 balls in it…use the gallon bag for a freezer storage bag. This is my kind of snack!! (Minus the chocolate chips.) Ahhh I want one right now as my afternoon snack. Could raisins be substituted for the cho chips? If you like the combo of raisins and peanut butter, you could absolutely substitute raisins for the chocolate chips! You could also just leave the chocolate chips out altogether and not replace them with anything. Hope you enjoy! I made these this afternoon. I did not have honey so I used maple syrup. It was difficult to roll them into ball as batter was pretty crumbly. I guess the honey makes they batter stickier? Nonetheless these were amazing! I don’t know if I am going to make them again because I can’t stop eating them!! Oh no, I’m sorry to hear that they were crumbly! I haven’t tried using maple syrup, but it definitely could be that the recipe needs the thickness & stickiness of the honey to hold them together. If they’re still crumbly, you could also try adding a little more peanut butter, just for some more moisture. I’m so glad that they still taste great, Monica! I wonder if part molasses and part maple syrup would have solved your problem? Those look really yummy for a snack/dessert! I like to have something on the way home from work before I run, and those look like they would be perfect. I think they’d be perfect to have before a run! Hope you’re having a great day, Rebecca! Oh, goodness!! I’ve been looking for a healthy snack that is also delicious. I think I’ve found it!! So good to know you can eat a delicious snack without the guilt! What great little energy boosters! I love the idea of making them into single serving “balls” smaller than a bar, but great for popping into your mouth, whenever the mood strikes. I love little recipes like this! They are so easy, no mess and really fill you up for a snack, not to mention they are perfect for pre or post workout snacks! So quick, so natural, so healthy. Liv, it cannot get much better! I have alll of these ingredients!!! <3 Can't wait to make them! Yay! Hope you love them, Farrah! I definitely made these as soon as I seen the post haha! They are delicious, I didn’t have honey so I used pure maple syrup, they were a little sticky to put into balls, but I found rinsing my hands after 5-7 rolls made them not stick so much to my hands. They turned out amazing! I even doubled the recipe because I knew my hubby would love them as well, they’ll be especially great for quick morning snack on the go! Thanks for sharing! I’m so glad to hear that you enjoyed them and made a double batch to start! It’s good to know that the maple syrup worked well as a substitute for the honey. I think I need to make another batch soon 😀 Thanks for the feedback, Rachelle! I just made these–my oldest grandson is in track and I think these would be perfect for him to take to his team!! You’re an awesome grandma! I ran track in high school and I would’ve loved to have these for a team snack 🙂 Hope his team enjoys them! I’m wondering about the fat content. You didn’t include that in the nutrition info. Knowing that each gram of carbs and protein has 4 calories, I can deduce that 56 of the 100 calories are carbs and protein (11×4) + (3×4)=56. So the remaining 44 calories must be from fat. Since a gram of fat has 9 calories, I can use the equation 44/9=4.89 to determine there are about 5 grams of fat. I just made these tonight. Family all loved them! I have used a similar recipe without the chocolate chips, which do sound like a grand addition, and they are yummy with fewer calories. do you think these could be made with PB2 instead of natural PB to help reduce some of the calories? Thanks!! Hey Stacy! While I haven’t tried it personally, I found a similar recipe that does use PB2: http://www.nothankstocake.com/2014/02/20/no-bake-energy-bites/. You could do some experimenting and try subbing the PB2 into my recipe or make the other recipe and leave out the coconut if you’d prefer. Hope that helps! So glad you enjoyed the energy bites, Didi! Crunchy peanut butter sounds like such a delicious substitution! These are awesome! Been looking for a recipe like this for a long time and these are perfect. I made them as soon as I saw the recipe. I made these, adding a good helping of cinnamon. Cause my house believes most everything is better with cinnamon! And they ARE absolutely yummy! Gotta make another double batch soon. Thanks for the recipe! I’m so glad you enjoyed the energy bites and it’s great to know that cinnamon works well in them, too. Thanks for the idea, Anne! I didn’t have any of the ingredients but wanted to make something 🙂 They are in the fridge now so we’ll see how they turn out. Just made these with added protein powder, almond butter and ground flax seeds. Called them oatmeal chocolate chip cookies and my boys love them! Thx for the recipe! Doubt there will be any left by tomorrow. I’m so glad your family enjoyed them! I love your additions and am dying to try making them with almond butter now. Thanks, Cherie! Wowwwwww, these are tasty! I added pecan and almond pieces for a little extra crunch. I think next time I will try adding protein powder and/or flax. So easy and delish! So glad you enjoyed the energy bites, Britt! Flax seeds and walnuts sound like awesome additions! Just wanted to check is it ok to have it everyday or is it ok to give to toddlers as I was reading that it’s not healthy to have uncooked or unsoaked oats as there are very dry and high in finer so can give stomach problems or severe constipation. Hi! The oats do soften up a good bit in this recipe from the liquids in the recipe (honey and peanut butter), so they’re not dry. Hope that helps! Your comment made my day! I’m so, so glad you’ve enjoyed making some of my recipes for your friends and family! That makes me so happy to hear. As for your questions, I’d add about 1/4 teaspoon of salt if using unsalted butter. I haven’t personally tried it, but I think subbing in an equal amount of cacao nibs or bits would work wonderfully! Hi! Just made these and I love them but I was wondering fi you know how many grams of fat each bite has! That would be super helpful for counting my macros! Hi, Kaityln! So glad you enjoyed the energy bites. There are 5 grams of fat in each one. Question: I don’t have access to a fridge right now. Do these have to be refrigerated? I love these things but I’m in the police academy right now and am living in a dorm room with no fridge access. Hi, Jennifer! As long as the peanut butter doesn’t have to be refrigerated like some natural types do, these don’t need to be refrigerated, either. Hope that helps! ok I’m gona your reciepe on the PB balls. Tried others…but none of them said,”HALLELUJAH” YOU MAY BE MY NEW BEST FRIEND! !HERE WE GO!! Made this yesterday and they are delicious! So easy and perfect to have with a cup of tea. So happy to hear you enjoyed them, Madeleine! I just made these as a snack so that I would not raid the vending machine at work. They are everything good that everyone has talked about. Will be making these on a regular. I also used agave instead of honey. They were a little crumbly but I kept forming them into a ball and they were find. I put them back in the freezer and they were perfect. ( I did use light agave and a little less than noted for honey). Thanks for sharing your adaptations, Yolanda! Glad to hear you enjoyed them! These are amazing and my 6 year old loves them! I feel so much better giving her these than packaged chocolate chip cookies or something like that. Total win in our house! I’m so happy to hear it, Cori! Glad you and your daughter enjoy them! I followed the recipe exactly as directed and these are delicious! Once you pop, you can’t stop…lol. I’m making more tomorrow since I only have 5 left. Thank you so much! Shared on Pinterest! “Once you pop, you can’t stop” <- Haha I love it! I'm eating the last one in my fridge as I type. So glad to hear that you enjoyed them, Leann, and thanks for sharing on Pinterest! So happy to hear that you enjoyed the energy bites, Shannon! These are so easy and SO good! Thanks for sharing! So happy to hear you enjoyed them, Leigh-Ann! I plan to make another batch this weekend! MUST they be refrigerated? Want to send to college grandson without a fridge! Hi Sylvia! There are some types of natural peanut butter that don’t have to be refrigerated after being opened, so if you use one of those, you should be good to go! Any kind with added oil shouldn’t need to be refrigerated after opening. And either way, they should be fine outside of the fridge for a few days! I’m guilty of the same thing! These are so good! My two year old love so them too! So glad to hear it, AJ! I’ve made these and my family of 6 loves them! Thanks for sharing the recipe, Liv. Can the chocolate chips be omitted without messing up the recipe? I am allergic to chocolate. Thanks!! The chocolate can definitely be omitted! Hi, 2nd time I’ve made these in a week, ????.. Because they are so lush…passed the recipe on already..used chia seeds in mine.. Thank you so much for sharing this simple but oh so moorish recipe ????????????????????????????????⭐️⭐️???????? So glad you loved these, Sam! I was looking for a really simple recipe that I could add golden paste to for myself and send some to my cousin and this recipe is the best, even with the modifications! I combined the first four ingredients, rolled into balls, then rolled in the cinnamon. Refridgetated to make harder. I love the peanutbutter and cinnamon combination. Your recipe has the best peanutbutter flavor! Loved this recipe!! Except my husband and I totally didn’t exercise self-control and kept snacking so I only got like 10 out of this recipe haha Also had some shredded coconut flakes on hand and threw them in. DELISH! Sounds like a familiar situation when I make these! So glad you enjoyed these with shredded coconut – yum! What if my peanut butter has honey in it already.. hmm. This is from someone who is all out of honey but would love to make these like now!! Hi Victoria! The honey helps bind the energy bites together, so I don’t think using just peanut butter with a little bit of honey in it would do quite the same thing. Feel free to play around with it, though, and hope you can get some honey soon to try these out! Tried these first ages ago, and love love love them! They are still our “go to” treat for my son, and for his soccer team! So glad to hear that you all love these! I have a batch stored in my freezer right now and snack on them all of the time! I just want to know, what will happen of you bake these ingredients in the oven as cookies rather than making it into balls? I prefer the cookie form and I like the four ingredients recipe! I’ve never tried baking them but I wouldn’t recommend it since they don’t really need to be baked and don’t have any baking soda, baking powder, etc. You could press them down to flatten them into cookie shape if you’d like! Should I want to bake them, what should I add? I seen that one can make cookies with peaunut butter, honey and egg? I want to do the oats as well- it makes it much healthier! It’s hard to say since I haven’t tried it but feel free to experiment or to Google a recipe with those ingredients you’re thinking of!! What is the shelf life of these bites? You can store these in the fridge for up to a couple of weeks, and then in the freezer for several months! Hi, Trish! I’m personally not a big fan of protein powder so I wouldn’t add it, but you definitely could add it if you have one that you don’t mind the taste of. Hope that helps! I added a mashed banana, should I put anything else in it? I’ve never tried adding banana, but you may need to add a bit more oats to accommodate the extra moisture from the banana. Thank you for a great simple recipe! 5 year old loves it! I just wanted to add my take on this recipe. The only changes I made was to put a lot less choc chips and also I chopped/ground the oats in my mini cuisinart. The texture is less raw-oaty that way. Now hopefully we can have some left over for the next couple of days….it will be tough! Thanks for sharing your adaptations, Alex! I’m so glad to hear your family enjoys these! How many Grams of fat are in there? If i use chia seeds, do i need to soak them to form the jelly consistency before using them? No need to soak the chia seeds beforehand! I used spelt flakes instead of oat and only had raw cacao powder instead of chocolate chips. needed 1 teaspoon more of honey so they stick together which was fine. My son loved them. Thanks for reporting back! So glad your son loved these! I reduced the amount of honey and added in a banana. Yum! So good! Sounds delicious!! Thanks for sharing your adaptations, Melissa! I’m a peanut butter fanatic. These were so delicious and easy to make. Anyway, I didn’t have any regular oatmeal so I actually used the oatmeal you get out of the individual instant packages. I also added the flax seed. It made exactly 24. When I rolled them between my hands, I kept my hand moist with water so they didn’t stick as much. I really like these. If i use rolled oats i don’t have to cook them 1st do i? Nope, no cooking of oats required! I make these often and have substituted agave syrup gor honey. Tbey are so good! I’m so glad to hear you enjoy these, Linda! I make them almost every week, too! I just made a batch of these last night. Super good and easy! Overall they are easy to make and very tasty. 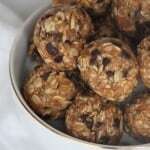 I make Peanut Butter-Honey-Oat bars that are pretty much the same as the energy balls. I now press the mixture into the cups of mini muffin pans so they come out the same size, and are much easier to remove than is cutting the original square pan into bars. I do add chopped walnuts, and today am adding chopped macadamia nuts, chopped pecans and chopped almonds as well, just a couple Tablespoons of them all to the mixture before putting it into the muffin cups. 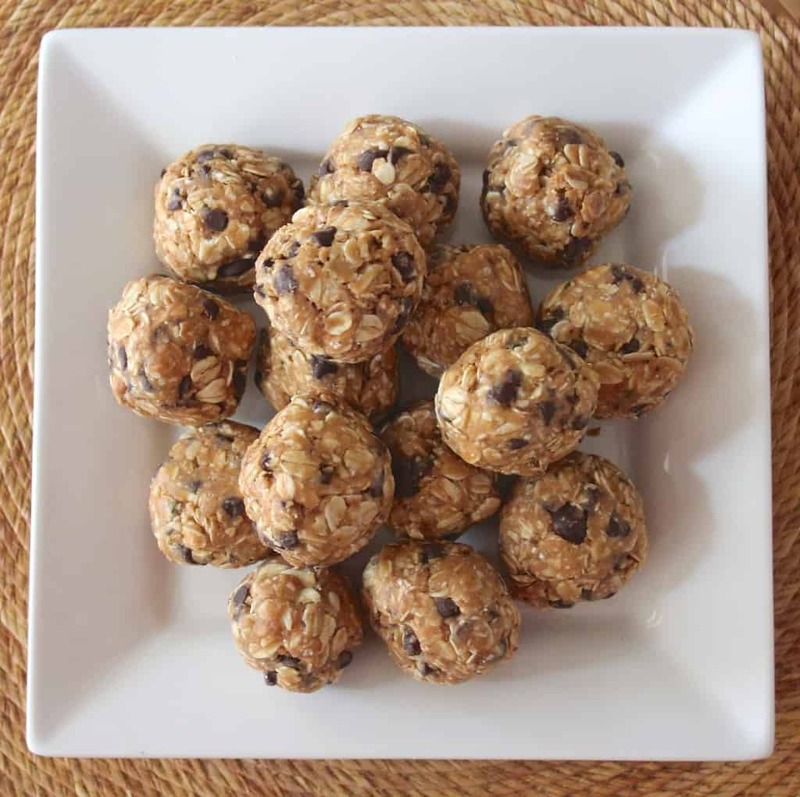 These are SO delicious–and with the addition of flax seeds, sesame seeds, and/or fenugreek, these can easily transform to ultra-delicious and easy to make lactation bites. Thanks for posting! Congrats, new mama!!! So glad to hear you enjoyed these energy bites! Just made these for Thanksgiving week for a healthy snack for all the relatives/guests to snack on between meals. Better and easier than making cookies! Thanks for including the nutritional info. How many bites are in a serving? Literally the best snack ever! Soooo good! can you use something like sunflower butter instead of peanut butter? I haven’t tried yet but I will soon. Although must i put chocolate chips in the mix?will it taste as good with out?I’m not a huge fan if chocolate so just wondering. You can absolutely leave the chocolate chips out if that’s what you prefer! Just found this recipe a week ago and have already made them twice! Simple, healthy, and everyone in my household loves them! I found a combo package of Chai seeds and ground flax at my local HyVee. Thanks!